Neither then nor now has that argument convinced me. I find it hard to believe that any kind of conscious, or even near-conscious, infidel resistance of the sort could carry on for 800 years. Could it be that after centuries of Christian practice and teaching all, most, or even a very large number of Saxons remained convinced pagans and were only pretending to be Christian? The idea seems absurd. But perhaps Heer only meant to say that a certain pagan ethos prevailed among the Saxons – but if that were the case, would they not have preferred the Catholic to the Protestant expression of the Christian Faith? Luther jettisoned the idea of sacrifice (the Eucharist for him was merely a kind of supper); the Catholic Church maintained it. And pagans always had it. Catholic worship is very sensual, as is pagan worship. We Catholics use images; we even venerate images. Our worship (at least traditionally) has appealed to all the senses – sight, smell, hearing, and taste – while Protestant worship has tended toward the cerebral only. Though Catholics do not worship a pantheon, we do have the saints, whose intercession we beg. We honor, even, a Mother of God! Such devotion would seem more readily to quench a pagan thirst than the Christus sine aliis devotion of the Protestants. Indeed, having been raised a Protestant myself (and a Lutheran, no less), I can attest to the sheer earthiness of Catholic piety, even in contrast to the rich liturgical sensibility of Lutheran worship. I recall, when I discovered the Faith, how surprised and delighted and awed I was with its materiality – it was as if for the first time I understood all the implications of the Incarnation. Veneration of relics or icons no longer seemed some excrescence of idolatry but the final, logical expression of the Word made flesh. It was as if the intuition of paganism had been healed of the disorders that had perverted it; its core of natural religion, restored, perfected, and elevated. An enormous mass of animal bones was removed from the so-called Knockenberg, near Schochwitz, early in the present [20th] century. It does not surprise me that, in the medieval world, certain vestiges of paganism should have held on. Catholic evangelization has been directed to preaching the gospel “to all nations” – to the conversion of whole peoples, with their cultures and institutions. When a Boniface or a Kilian or an Augustin evangelized, he brought in not just here and there an individual, but kings with all their subjects. Such mass conversions have been criticized as insincere, but such a judgment misunderstands, I think, the mind of ancient man. They were casting off one god for another – both of whom they thought were real. (And did not St. Paul himself say the gods of the nations were demons? Thus he, too, thought them to be something more than mere human creations.) They had every reason to think that what the priests told the about Christ was true, though they probably did not understand the teaching very deeply. Their faith was like that of a child – which is as true a faith as any other, even if not very refined. Of course, the approach of mass conversion draws in all sorts of people – the ardent and the slack, the well catechized and the ignorant, the seeker after virtue and the barely continent, even the insincere. That pagan practice would still be a draw – even as would sin – among such converts is not surprising. The Church, as a hospital, does not discriminate on the basis of infirmity; for her Master is the physician sent to heal sinners, not the righteous. That Christians today (at least in Europe and North America) have seemingly cast off all vestiges of paganism is a tribute, not so much to the purity of their Christian faith, but to the materialist and rationalistic atmosphere of the society that they take in with their first breath. We prefer our God and our angels in the heavens; earth, we tend to assume, is subject solely to natural causation (except for the occasional miracle that we grudgingly will admit.) Our world is given to us, neatly packaged by empirical science. Whatever mysteries remain, they will not be explained by angels or demons, gods or demi-gods, but by the laws of mathematical physics or chemistry or genetic theory. Our world, unlike that assumed by medieval men does not vibrate with spiritual agency. Thus we are not tempted to offer sacrifices to Lubbe or the “good Lutze,” or any other deity. Our struggle is to believe in God at all. The undercurrent of a pagan ethos among the peasants of 16th century Germany is one of the strands from which I weave my tale, A Song for Else. In the story, one finds the vestigial presence of paganism in peasant custom, in the sensibilities of the “Folk,” and it is conjured up by the preaching of wandering, heretical preacher. Finally, it becomes s one factor that drives the protagonist, Lorenz List, to the deed that ultimately changes the trajectory of his life – and of the woman he loves. 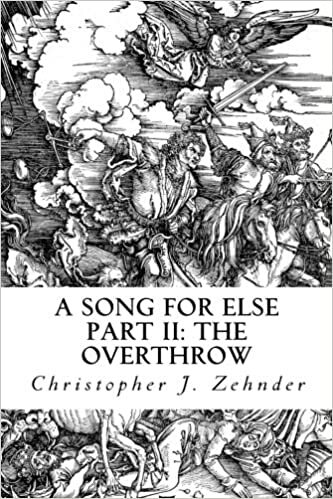 A Song for Else currently comprises two parts of a projected trilogy: Part I, The Vow, and Part II, The Overthrow (which takes the main character in the opening years of the Protestant Reformation in Germany). To read an excerpt from Part I, please click here.